Jurassic World: Fallen Kingdom has arrived in cinemas to mixed reviews. 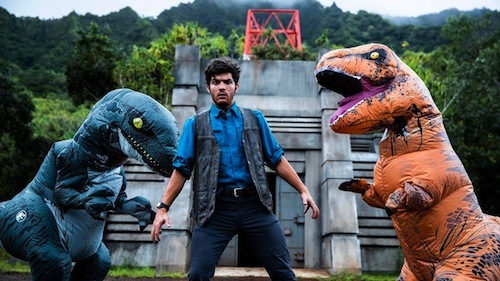 However, this officially endorsed skit, filmed in Hawaii by extreme sports videographer Devin Graham (better known as Devinsupertramp on YouTube), should gladden the heart of even the most jaded fan of the dinosaur franchise started by Steven Spielberg 25 years ago. From building Tamiya model kits, on rainy days, to playing with Transformers' Dinobots, dinosaurs captured my childhood imagination. So much so, I would record myself reading passages from well-worn dinosaur books and play them back, taking inspiration from read-along books for Star Wars and Disney's The Black Hole. I would actively seek out B-movies to satiate my fascination for the extinct species. And seeing Jurassic Park, for the first time in 1993, is a cinema experience I'll never forget, joining the Hollywood pantheon of Star Wars and Terminator 2: Judgment Day. Seeing Jurassic World: Fallen Kingdom? Let me know in the comments below.